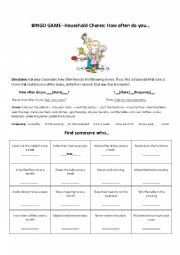 Each student receives one filled out message card and empty Bingo sheet. They walk around the classroom writing messages and phone numbers from other students using the model at the bottom of the page. 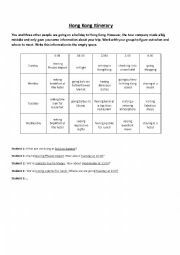 Once they get the four pieces of information, they ask another student the same questions until someone gets Bingo. Students presented an object for show and tell. Prior to this, I did a lesson on describing objects. This presentation was a good follow up to that. Fill in the blank using the itinerary above. 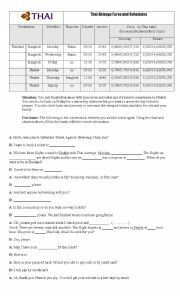 Good for teaching about airplane schedules and itineraries. This Bingo game worked well at my Thai high school. 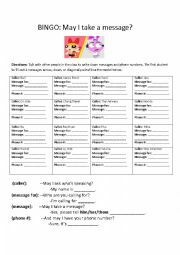 Students use the modeled dialogue to ask other classmates how often they do household chores. First to get 4 across, down, or diagonally wins! Students walk around the classroom asking other students if they are able to attend their party. If the student that responds is free on the day asked, the host writes the name of the invitee in the right-hand column. The biggest party/first to 10 names wins! Stds get in groups of four asking each other for the missing information. 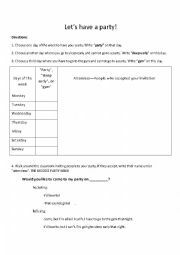 They write in the blank once one member of their group notifies the rest of the group what they�re doing. Here are my classroom rules for my high schoolers in Thailand. Humor is the solution in this country. Feel free to email me to get the wheel of punishment. powerpoint on some jobs. This is more for the intermediate level.